Welcome back. You know what bothers me? Well, lots of things but especially politics. Politics was ok until…what?...10, 15 years ago? Whenever partisanship started replacing common sense. With Congress’s approval rating struggling to stay above the approval rating of my beloved cockroaches, I guess I’m not alone in my opinion. I have friends and acquaintances that cover the political spectrum and might even vote based on a single issue like gun control--some for, some against. I can ignore their politics; they’re friends and acquaintances. It’s the government I can’t ignore. A recent behavioral research study has identified a potential role model whose strategy our dedicated federal government representatives would do well to adopt, whether they’re driven by reelection, lobbyists or principle. It’s a stretch, but see what you think. The published report was authored by collaborators from the University of Leuven, Belgium; University of Sao Paulo and Embrarpo Semiarido, Brazil; York and Sussex universities, UK; and the Agricultural University, Poland. The findings are based on long term, day and night monitoring in Brazil, where, despite the latest street protests, there are residents who are models of harmony: spiders, at least one species. The Parawixia bistriata are relatively large orb-weaver spiders, spinning webs with lines that spiral outward from the center, that reside in semiarid habitats of Brazil as well as Paraguay and Argentina. During the day, these spiders share a temporary shelter. At sunset, however, each goes off to build its own web within a communally built framework of permanent, thick silk lines that reach between trees and bushes. 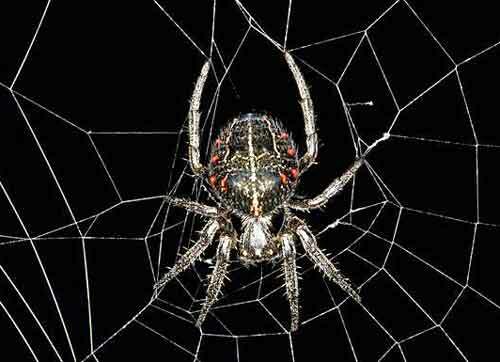 As soon as a spider begins its new web, it defends the web against any encroaching spiders by bouncing on its web. This action is normally enough to chase away trespassers without coming to blows. As the communal framework fills with webs, some spiders (less than 7 percent) find themselves with no space to build a web. These spiders don’t throw in the towel and stroll back to the temporary shelter. If the web-less spiders approach webs and are threatened by the resident bouncers, they are not inclined to be chased away; less than half leave. It’s not that they get hostile; they just hang around scrounging tidbits of captured prey from nearby webs. What’s interesting is that the resident spiders accept this, presumably because it’s less risky than fighting. That today’s resident spider might be tomorrow’s freeloader could also be a factor. Compare this nightly demonstration of spiderly cooperation to what’s been occurring with Congress. When in “power”--I use the word loosely, each political party does its best to capture the prey, without sharing crumbs or leftovers. When not in power, each political party seems to go out of its way to prevent the other party from building its web. Fortunately, the communal web framework is strong even if they all bounce around a lot. Thanks for stopping by.